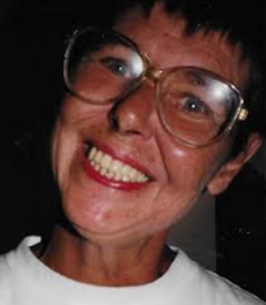 Wallace, Elizabeth (Betty)- suddenly at home, on Wednesday September 12, 2018 at the age of 74. Dearly loved wife of Stewart Wallace for more than 29 years. Cherished mother to Nicole McInnis (Mike) and Eric Paul Cote. Step-mother to Lynn Coleman (Pete), and Nathan Wallace (Christine). Cherished memories are left with her seven, adored grandchildren; Cody, Courtney, Kaylin, Taila, Mason, Julia, and Devin. Betty also leaves behind extended relatives George (Viola), Allan (Janice), Ken (Marilyn), Helen (Brad), Mary (Neil), and Philip (Janet). Betty will be remembered fondly for her sense of humour, and the tremendous amount love that she had for her family. The family will receive friends at the TOLL FUNERAL HOME, 55 Charing Cross Street, Brantford on Monday, September 17, 2018 from 2 p.m.- 4p.m. & 7p.m.- 9p.m. A Celebration of Life will be held in the chapel on Tuesday, September 18 at 1pm. Donations in memory of Betty can be made to the Brantford General Hospital Foundation.